Meet Mrs. Nzioka the deputy head teacher at Mutaki primary school. Mutaki is approximately 110 km East of Nairobi. Mutaki owes its history to the late Mutaki, who on his death bed donated a small portion of his land (roughly less than 40x80 acre) to the community to build a public school. This was to reduce the 20 km daily return trip covered by children on bare feet to the nearest local school - Imale. The first and only classroom existing as till 2014 was constructed by parents - built on mud, and thatched with temporary roofing. This class could only accommodate class one pupils. In the coming year, there was a new need for a class two classroom; the school had pupils and no funds. The solution was to virtually separate the classroom into two with class one pupils seated on one side and class two on the other. The blackboard was again shared in half, having no physical boundary to separate the sessions, you often found pupils copying the wrong notes. Fast forward to 2015 and help came in the form of Turk and Well Aware who offered to assist with the then ongoing construction of a third class. The new class was different in style having aluminum roofing, brick walls and a corridor. Later came gutters and water tanks to collect and purify rain water. At this point she laughs, she had never noticed how far the 30 minutes’ walk to the nearest stream was, nor how dirty and unhealthy the donkey water was for the kids. When the donkey man didn't come, then they didn't eat. That's in the past, she has water flowing right into the school’s kitchen, which she proudly shows off mocking the old jerrycans and beakers that are nonexistent in her compound. Currently, the school has enough water to drink, cook, clean hands, you name it... This year for instance, the region suffered a massive drought yet the school never bought water, nor did they have to ration supply at the hand washing stations. The school is grateful for the transformation Turk and WA have done to this school, from a tiny one classroom to an 8-class school with a Library, kitchen, and dining hall. 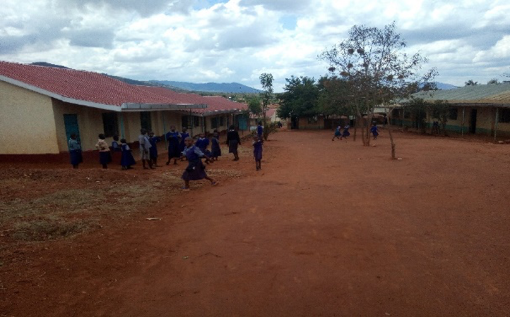 Mrs. Nzioka calls her school the most beautiful primary school in Eastern province and indeed it is, only lacking a fence and gate to pass for a city school. The school has now attracted pupils from a radius of between 10 to 20 km. Given the quality of education, the school has potential to grow to a boarding school, and if not then it has the potential to own a couple school buses to transport the many pupils from other regions.